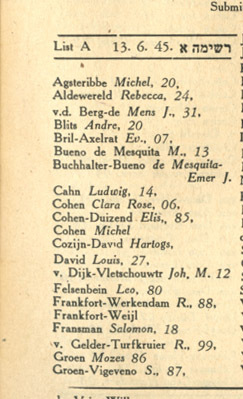 A list of Jews who survived the camps in World War II and arrived in Amsterdam. The list was submitted to the World Jewish Congress in June, 1945. Please enter the following in the appropriate fields: Surname, Given name, maiden name (if given, usually after a hyphen), birth year (add 18 or 19 before the number as appropriate) and town of origin. If a field is unclear or missing, enter a ? in that field.